Loud pop music booms across the market square in Sassari, Sardinia's second-largest city. Italy's political pop star, Matteo Salvini, is standing on the brightly lit stage with his back to the audience. With his arm around a young man, he is taking a selfie. There is a long row of the far-right politician's supporters lining up to come onstage. Among them is even a family with dark skin, obviously of migrant heritage. Salvini smilingly takes a souvenir photo every 30 seconds. This goes on for two hours. These selfie sessions are the trademark of his election campaign. In between, he smokes a quick cigarette or gives an interview to one of the television journalists present. A little teddy bear, given to him by a female admirer, peers out of his trouser pocket. The interior minister's straight-talking and tough stance on migrants have made him popular with many voters. He is ahead in the opinion polls. Were he to break up the 8-month-old coalition with the populist 5-Star Movement in Rome, he would have a good chance of becoming Italy's next prime minister if new elections were held. Political commentators in Italy are speculating that he will feel strong enough to take this step after Sunday's regional elections in Sardinia and the European elections at the end of May, which Salvini and his League (Lega) party could win. Salvini already won a test election in the Abruzzo region two weeks ago. The region's new president is from the neo-fascist, nationalist conservative Brothers of Italy party. Salvini responded with a short laugh when asked by DW whether he wanted to become prime minister soon. "I am the interior minister. I have no intention of becoming prime minister. I take care of public security, the mafia, people smuggling, drugs, terrorists. It's an honor to do this job. I intend to keep doing it for a long time to come," he said. For the preceding six days Salvini had toured Sardinia, describing Sunday's regional election as a litmus test for the whole of Italy. "You only have a choice between the Lega or the left, a choice between the future or collapse. Let's get rid of the left!" Salvini calls to cheering fans at the fish and vegetable market in the coastal town of Alghero. By the left, he means not only social democrats and communists, who have now anyway been pushed to the verge of insignificance, but also the populist 5-Star Movement, the little-loved coalition partner in Rome. In his short speeches, Salvini rages against migration, promises to revoke pension reforms and calls for more respect for the nation. "We have a flag; there is a language, an identity, a history, a tradition, a culture that we need to live by. A tree without roots will die," he says. Amid jeers from the crowd, he calls out to the few protesting opponents there at the market that he cannot take people who "see fascists and Martians everywhere" seriously. Donnatella Morittu, a vegetable vendor in Alghero, would like to see Matteo Salvini as prime minister: "That would be great!" And she is certain that something will change in Italy's political landscape after the European elections, at the latest. Donnatella Morittu used to sympathize with the 5-Star-Movement. "But they made a lot of mistakes. With Salvini, on the other hand, you can see that he is tackling things. And he's good-looking, too," she enthuses, vigorously packing clementines for a customer, who nods in agreement. Meanwhile, Salvini continues taking selfies on a small podium in Alghero's crumbling indoor market. He takes his time, hugs people, jokes, chats with locals. When asked why he spends so much time posing, the minister doesn't miss a beat. "I listen to people because people also listen to me." A pensioner, Gavina, is also enthusiastic about Salvini. She sets down her shopping bags, raises her hands and emphasizes her words with sweeping gestures: "He is the only one who does something concrete and keeps his promises. The only one!" The head of the Lega party prides himself above all on the radical change in migration policy. He says he has closed Italy's ports to migrants. Refugee ships are no longer allowed to dock, Salvini calls out to the crowd. People respond with cheers. Read more: Will populists unite to blight the EU? Coalition with Berlusconi and the neo-fascists? Local fishmonger Salvatore Manca is convinced that Matteo Salvini will ensure order and security. "He loves people. People like him, and the police do, too," Manca told DW. "He should join together with the Brothers of Italy and become prime minister," Manca says. The Brothers of Italy are a neo-fascist party that, together with Salvini's League and the Forza Italia party of former prime minister and media billionaire Silvio Berlusconi, could form a right-wing populist coalition. In a recent interview, Giorgia Meloni, the extreme nationalist leader of the Brothers of Italy, already put himself forward as a potential coalition partner if new elections take place. Silvio Berlusconi, 82, is also not averse to forming an alliance with the radical right. Speaking to DW after Sardinia's election campaign, Antonio Di Rosa, editor of the major Sardinian newspaper La Nuova Sardegna, says, "Italy is confused and drifting to the right." Di Rosa has spoken at length with Matteo Salvini and is convinced that the interior minister is proceeding according to a very smart and clear plan. "He is a strategic politician through and through, but he has no culture or deeper knowledge. He does what's useful to him, without any underlying beliefs," warns Di Rosa. According to Di Rosa, the populists of the 5-Star Movement are in a deep crisis because they always say no to everything. 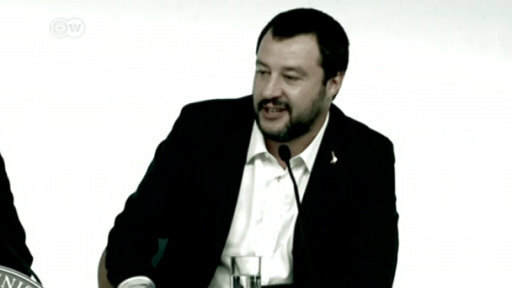 "I think Salvini will bring about national elections after the European elections and then forge a new right-wing coalition. After these elections we will have a new government," says Di Rosa. Riding on a wave of popularity, Italy’s far-right interior minister has hit the election trail for the League in Sardinia’s regional elections. Salvini’s party has overtaken the 5 Star Movement in the polls and hopes to secure a victory in Sardinia.